I grew up on a lake back east; I dyed this with the bright green of the grass, the darker green of the trees, the blue green of the algae, and the blue of the water in mind. This is a 6 oz braid of hand dyed alpaca top which was originally a silver grey color. I dyed it in a crockpot I use specifically for soaps and dyeing. I bought a starter kit of Greener Shades dyes recently from a friend who is a distributor; they are dyes that use no chrome or tin to brighten colors and therefore are safer to dump in sewers, and onto garden beds. 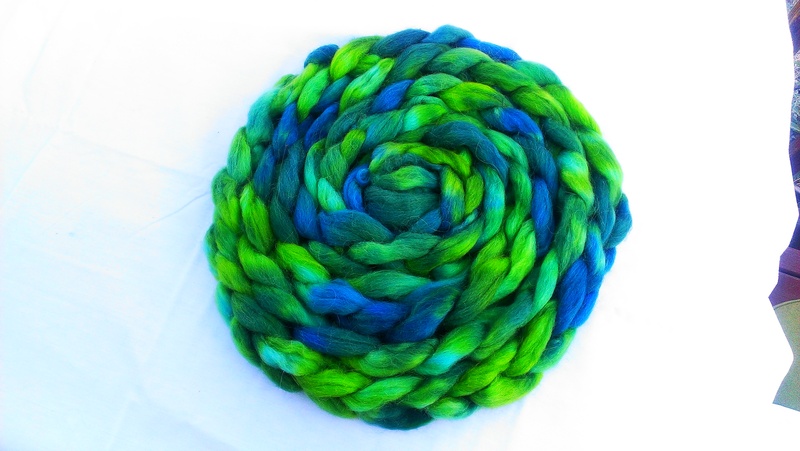 While my favorite way to dye is with food coloring – easy, bright fun colors – the darker colors tend to “break” meaning they are a mix of lighter and darker dyes, and under the heat stress of dyeing they separate into their constituent colors rather than dyeing the color you want. Blue, purple, and black are notorious for this. This braid is for sale in my ArtFire shop and is currently the ONLY thing I have for sale there. This evening I hope to take more photos of my hand spun yarns to put up in the shop; this will take some time because while I tracked the yardage while I was skeining, I couldn’t put tags on them until after I washed them and so I need to recount each skein for yardage before I put them up for sale. I really need to figure out a better way to do this. There will be more offerings soon so visit often! Not on these. These are finished. The yarn is hand spun superwash Blue Faced Leicester, purchased when I thought I was going to have time to actually make a business out of my crafting. Purchased, not incidentally, for the specific intention of spinning sock yarn. ETA: I know I have said before that superwash isn’t as good for use in socks, but I wasn’t buying this for me. I was buying it to spin and sell, which didn’t end up happening. 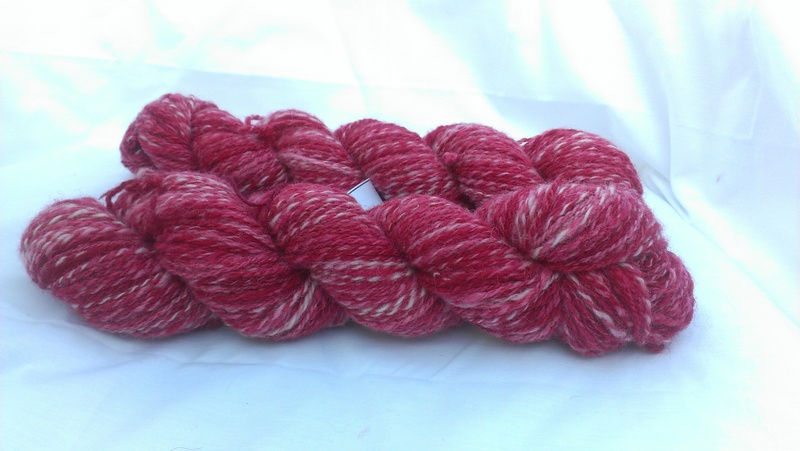 I still have several pounds of this to use up; if you want hand dyed hand spun sock yarn, email me for prices. I used it for Mr. Tin Foil’s hose because this is pair #3 I’ve made for him, and pair #2 of hand spun. He is *very* hard on socks. I’m hoping these hold up longer than the last pair; I made his last pair out of worsted weight wool and he wore a hole in the tops of the toes the first day he wore them. We all (friends who also wear kilts/hose) told him he must walk by curling his toes up every time he picks up his foot in order to wear holes in the tops of the toes. He wasn’t amused. There is a supposedly debunked urban myth that says knitting a pair of socks takes as much time and as many stitches as knitting a sweater. I say supposedly debunked because the debunker did some math and decided that was not possible with size 3 needles and regular socks. Said debunker has obviously never knit a pair of kilt hose on size 1 or size 0 needles or said debunker (who shall remain nameless though if you look I’m sure you can find the relevant information) would not be so sure. 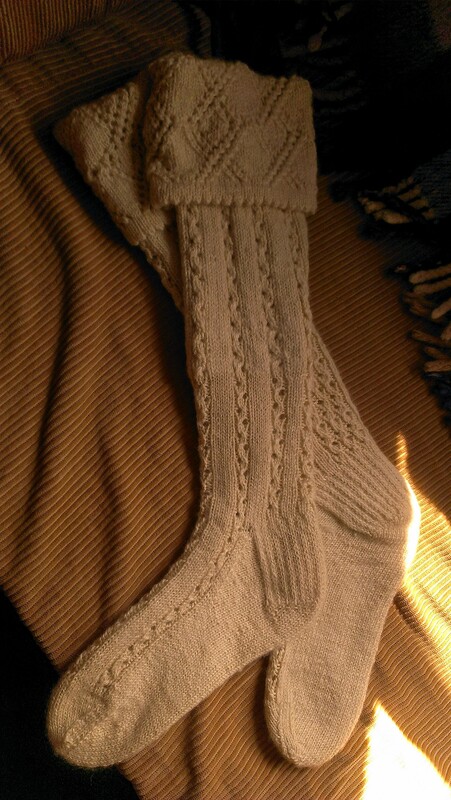 These are made on size 2, which to me is HUGE but made the knitting of these go relatively quickly. No. I give up on making more things for family members who don’t care and don’t appreciate it. I just can’t spend that much time making things for children whose parents put it away and the kid never wears it because the parents don’t put it on the kid. I just can’t spend that much time making things for adults who put it in a drawer and let moths eat it or even worse, never even acknowledge they received the gift. Cash is more expensive in dollars, but easier on my heart by far. I guess it will free up more of my time to spend on making things for sale — I do a fairly good side business with my weaving and knitting; if I”m not wasting time making things for family members who don’t care about the gifts anyway I will certainly have more time to design and weave things that may actually sell. Or to design and weave things for myself. Yes, there was an incident that provoked this post. I asked someone of the same approximate age as my children if I was being overly sensitive and was told no, that I had every right to be upset. Ah well. I will save my creative energies for those who appreciate them I guess. Fewer tears for me. Would you – you personally – intervene to stop this woman from taking this job? Would you – you personally – be willing to look her in the eyes and tell her that she may not take that job? Would you – you personally – inform this young woman (with regret, of course) that she must remain unemployed for the time being and resume her job search elsewhere? And would you – you personally – be willing to use force against this woman to prevent her from working at $5.00 per hour if she stubbornly ignores your demands? Would you be willing, if her stubborn refusal to refuse the job persists, to poke a gun in her face to prevent her from working at an hourly wage of $5.00 per hour? But I wonder how many of you – you personally – have the courage of your moral convictions to be able to look the woman in her eyes and expose yourself personally, to her, as someone willing to deny her the opportunity to work at the highest wage she can now earn. And if I’m correct, how can you, in good conscience, continue to feel that minimum-wage legislation is ethically justified? The fact that I don’t eat fast food and can’t afford maid service aside and so never would have heard this conversation to begin with — I personally would have NO compunction about intervening in this situation, and making a report to the appropriate agencies as well as the division office of this fast food restaurant. I would intervene for a number of reasons. That’s because I can think logically. First, if she was here as a refugee, the government would have offered her employment assistance and therefore she would not be begging for a job at less than minimum wage. If she was here legally, she could also appeal to a number of government agencies which would be happy to assist her, on a level they do not seem to display for natural born citizens, with finding employment or in getting public assistance. Second, I can do math. If this situation were to happen without intervention, the very next thing to happen is that the manager would call his buddies and tell them that he got someone to work for less than minimum wage, and find out if his new girl has friends he can hire or refer to his manager friends. The next time an employee calls out, or has any sort of a discipline problem, they will find themselves out of a job and yet another person willing to work for less than minimum wage will be employed. This, I believe, is called wage deflation. Paul Krugman has an excellent article on this very phenomenon I found when I went googling a definition for wage deflation. Now, opinions on the REST of Krugman’s essays and work aside, this is a very commonsense and easily understood essay describing this problem. Third, I can see the end resulting from this cause. This will have ripple effects – or as the Aussies and the English say – a knock-on effect on the rest of the economy. Because her wages are less, eventually there will be more people working at less than minimum wage than can be policed by agencies responsible for ensuring compliance with the minimum wage. People will not speak up, because they will now be working outside the law – and those few who still work for minimum wage will be in fear of losing their own jobs. These people will have even less money to spend on the basic necessities and therefore can’t. Sectors not directly related to fast food will experience loss of revenue and layoffs will begin in those sectors. Even the manager who began paying less than minimum wage will find that his bonus is cut, or the cost of living raise he was expecting, is not going to be happening. This will ripple across the economic landscape, and up the pyramid of unskilled, semi skilled, and skilled workers, to ultimately affect the owner class at the top. Of course, they at the top don’t rely on actual business earnings for their money, they rely on fantasy money produced via ‘vehicles’ such as bonds, stocks, and derivatives, so it will be quite a while before they realize that the REAL economy and money that their fantasy money used to arise from is, in fact, fantasy. This author relies on shame and an appeal to the emotions in making this case, not logic. This is why I think most Libertarians of today are just selfish shits who don’t want to share the sandbox, and can’t logically think their way out of a paper bag. Or, as my ex-husband use to say, they don’t have enough brains to pour piss out of a boot. We don’t live 150 years ago, and thankfully so, or most of us would be working in factories or mills for those business owners at pennies per week, 16 hours a day, 6 days a week. We would have started working at as young as 6, and most of us would die from malnutrition or diseases easily prevented by proper diet, basic sanitation, and sunshine. Yet these Libertarians would happily do away with minimum wage even though their wages are predicated on that minimum standard, and would decrease by a LOT, if it were abolished. The concept of days off arises from the same place and time where minimum wage was implemented, and I’m sure Libertarians enjoy their holidays and days off as much as the next person. Same for medical care, enough food to eat, the ability to live where you want…you get the idea. It is BECAUSE of the abuses inflicted on the unskilled and fearful populace in previous centuries and eras that we have the protections — the privileges of middle class life — we have now. I agree that regulation has gone too far. I can’t, for instance, open a business out of my home, because I live in a residential area. You can’t have manufacturing in a residential zone unless you want to drastically increase your tax burden and open yourself up to a whole host of new regulations. If I were to ever get to the point where I wanted to open a store to sell my hand crafts, I would need to pay rent for a building miles away, all the utilities, fire/theft/liability insurance (because someone might strangle themselves with a skein of my yarn and I’d be liable), the gas to drive there and back, and so on…. They are right in this point of view. It would be even worse if I were to build a building myself. Construction insurance, loan insurance, building codes (including the Universal Fire Code — look that baby up if you want to be goggled with horror at ridiculous regulations! ), handicap access, etc. If I were to hire an employee it would get even more onerous. Minimum wage, of course, but also Social Security tax, Medicare tax, state taxes, county taxes, and on and on…. or I could hire the employee on a 1099 as an independent contractor and let him/her worry about it, but I’m sure that opens me up to further regulations I can’t even conceive of right now. Like I said, regulation has gone too far. In this I do agree with Libertarians. How to fix this? I don’t know. I do know that slashing minimum wage without dealing with the economy strangling regulations (and the government entities creating more and more every day) is NOT going to work. Appealing to flawed logic and misplaced compassion for an agenda that benefits business owners – the 1%’ers greatly in the near term, and hurts them in the long term, is NOT the way to go about this. ETA: I have more thoughts about this, but I don’t want to make it too long. I’m on vacation from school until next week so I will actually have time to put thought to form. I looked in the skilled trades/crafts section of Craigslist today, just to see what types of jobs are being posted. And that’s about it. I had to laugh — did I really think I was going to find a post wanting a weaver?? Or a spinner?? I am doing my first commission spinning though, nearly 2 lbs of an alpaca cria (baby) fleece (actually it’s called blanket) my friend tried to process and was worried she was going to destroy if she did any more. Some of it is already in roving with lots of nepps (little balls of fiber) and I’m spinning that into singles that will become a worsted weight 3 ply. Some of it is washed but not processed in any other way; this I will card on my drum carder, very slowly and carefully to keep the smooth and lofty nature of the fiber. Ideally, the owner of the fleece (not my friend, she owns a fiber mill) will end up with a textured yarn and a smooth yarn, and be happy with her first fleece product. She is new to owning fiber animals, and recently learned how to knit in anticipation of using her own yarn. I am enjoying spinning this so far; it’s deliciously soft and fine and most of the prickly things are falling out as I spin. I wish I could do more commission spinning and less actual working. It’s less money by a long shot, but I don’t have to get dressed up, drive a long way away, worry about meals and drinks, or stress out about deadlines or working overtime. I don’t agree with lots of things Cornel West says, but in this case, he can’t speak loudly enough. I had my birthday recently and I made some resolutions. I never do them on New Year’s Eve, it’s not my new year – my birthday begins a new year for me. I disabled my account on Facebook. I joined to follow my children but it just takes too much of my time. I miss seeing pics of the grandbabies but not enough to sign back up. I have severely limited my time on the computer unless it is for school work. This actually interferes with one of my jobs but that’s OK. I’d rather make less money and have more time. I still haven’t gotten serious about an exercise program but that’s coming, it’s still pretty hot here in the desert for workouts when you cool only with a swamp cooler and fans. I already eat pretty well, so that will continue. I plan to make more time for the crafting business aspect of my crafting business — treating it like a job, making time on a regular basis (even 15 minutes is more than it often gets lately). I can’t sell things if I don’t make things. And I really want my husband to get more involved with the photography aspect so that my online photos do my stuff justice. I try, but it’s just not my thing. My loom is pretty self explanatory; my spinning wheels are pretty complex but don’t take a 250 page book to understand. Our camera does. I am going to do more winter gardening and after my final next week I’m going to get the winter veggies started. I would like to buy a grow light, but they’re fairly expensive. I’ve been reliably informed that my regular light bulbs do not give my plants the light wavelengths they need for proper growth. That’s all. I can’t get too crazy about the resolutions because now they’re public and I’ll be held accountable to them by those who are closest to me! Hand spun Shetland wool, cream and natural brown colors. Dyed with natural dyes, from top to bottom: Holly hock, onion skins, annatto, chrysanthemum, henna, holly hock. And I’m telling ya, I did not see that seafoam green coming from a holly hock dye pot that was burgundy colored! It’s 84 inches wingspan, 25 inches deep, knitted neck down. I used pretty much every single yard of each color which is why I chose neck down. 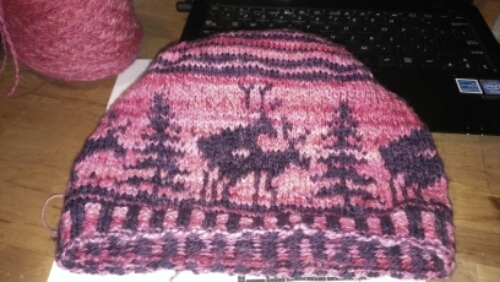 The lace patterns are not centered because I didn’t know how much space each section of color would take up due to the increases and increasing stitch counts every two rows. I’m just not a very good weaver I guess — I hate sewing. So I still have a pile of weaving to hem! Gotta get to it today, because I have to take my stuff to the gallery by Wednesday. Nothing like a deadline to motivate me…days like this make me wish my grandmother were still alive. She was a professional seamstress for most of her adult life, and made much of our clothes when we were growing up, including our bathing suits (anybody remember Stretch and Sew patterns?). She could have finished all this stuff in no time and done probably a much better job than I will do. Certainly she would have done it with less swearing! I have had three job offers in the past week, pending background checks and reference checks, of course. But for the job I really want I’m still waiting on the second interview. I will accept one, and probably two of these offers, so that I have income while I wait for my preferred job. I hope I do get an offer from them.